SPRINGDALE, Ohio -- The building at 411 W. Kemper Road still has the recognizable shell of its previous life as a Taco Bell, but step inside and a delicious aroma quickly snaps you to attention. The space has found new life as a shared commissary kitchen supporting three businesses specializing in international cuisines: Simply French Cuisine, Empanadas Aqui (Venezuelan) and Just Jerks (Jamaican). This former Taco Bell building at 411 W. Kemper Road in Springdale has found new life as a shared commissary kitchen, supporting three businesses specializing in international cuisines: Simply French Cuisine, Empanadas Aqui (Venezuelan) and Just Jerks (Jamaican). How the shared kitchen came to be started with husband and wife Ashford and Alicia Hayles, who opened Ena's Jerkmania in the building in 2011. "Me and Alicia were out in Maryland -- we had just started a family," Ashford said. "We just wanted to be closer to family, so we took that leap of faith and said, 'Let's move back home, start a business and everything will work out.' "
A Just Jerks rice bowl. The couple started fast-casual eatery Ena's Jerkmania, whose sign still holds a stake at the front of the building. 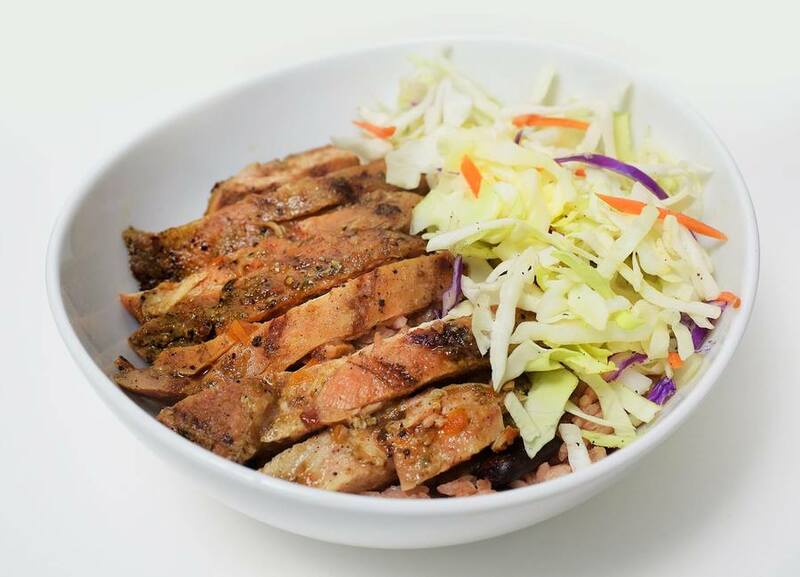 "We did sandwiches, wraps, rice bowls -- you had the choice of different meats like pork, chicken and beef -- and you could get them in different jerk sauces," Ashford said. Jamaican cuisine is in Ashford's roots: His family migrated from Jamaica to the United States when he was just 3 years old, and his mother, "Ms. Ena," created the jerk sauces that Ashford still serves today. In 2013, Ashford and his wife added a food truck called Just Jerks to augment the restaurant business, but running both operations soon turned out to be more than they wanted to handle. Food trucks are parked outside of the shared kitchen commisary, home of Empanadas Aqui, Simply French Cuisine and Just Jerks. "It was a day when the restaurant was extremely busy," Ashford said. "Two people called off, the truck had to go out and it was just me at the restaurant." That day proved to be a tipping point; Ashford decided to lose the restaurant and go fully mobile. The couple closed the restaurant in 2014 and made plans to vacate the building, but a chance meeting with Pat Fettig of Empanadas Aqui changed their course. As it turned out, Empanadas Aqui was looking for a commissary kitchen. Fettig, along with her nephew, Brett Johnson, and his wife, Dadni, own and operate Empanadas Aqui, a staple among food-truck goers. 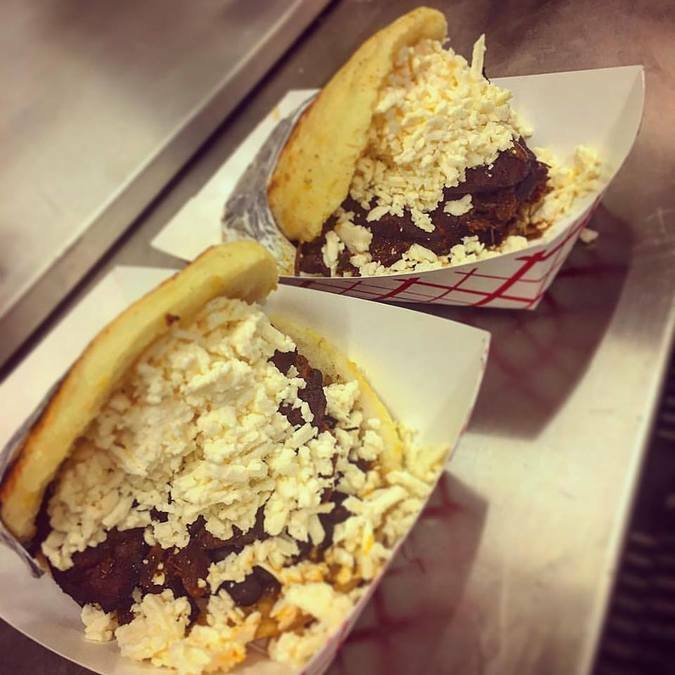 The food truck is known for its savory and sweet empanadas, along with the more recent offering of arepas (stuffed corn cakes). The kitchen has allowed Empanadas Aqui to expand and gain new efficiencies. "We have space for prepping and holding. There's no need to go to the store every two hours," Fettig said. "It's a better system because we have more space to do more things," Dadni said. "We can go from cutting two boxes to eight boxes of peppers." In time, Simply French Cuisine also joined the culinary family. Originally from France, Brigitte Cordier and Anne Fribourg started Simply French Cuisine in 2015 on a mission to serve an authentic taste of their home country. "We want our customers to experience authentic French cuisine," Cordier said, adding that French food is not just about heavy cream and rich sauces. "We use a lot of fresh vegetables, local and organic ingredients as much as possible," Fribourg added. Simply French Cuisine offers catering, meals to go and cooking classes. Since moving into the kitchen, its business has transformed from a cottage industry into a full-fledged company. "Our customers wanted more, but we couldn't deliver more until we had a commercial kitchen," Cordier said. Its menu items include quiche, salads, hors d'oeuvres, and elegant cakes. Simply French Cuisine also makes hard-to-find croquembouche, a grand dessert of pastry rounds assembled in the form of a tower, held together by caramel and spun sugar. This international food family couldn't be happier with their kitchen arrangement. "We work really well together, and we get to see how everybody operates," said Empanadas Aqui's Brett Johnson. They happily become each other's focus panels for any new menu item, and their diversity sometimes sparks unexpected collaborations. Dadni Johnson recounted the time Alicia Hayles asked her to put Just Jerks' curry chicken in their empanadas. It turned out so well, Empanadas Aqui will start making empanadas with Just Jerks' curry chicken. "There's a huge market for a production kitchen with food-truck infrastructure," Ashford Hayles said, adding that he's had a number of inquiries from other startups to join the already full kitchen. "The challenge now is telling people no." For Dadni, the benefit of sharing the kitchen space is much more visceral. "The best thing about it is walking in here and smelling the food," she said with a smile.